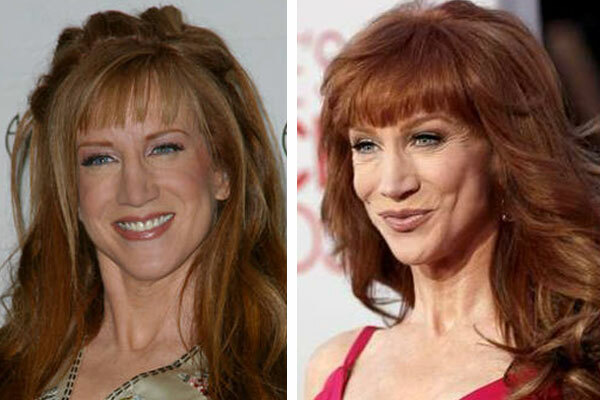 Comedian and plastic surgery advocate Kathy Griffen has never been one to keep her cosmetic enhancements under wraps. After a nearly fatal liposuction procedure in 1999, Kathy has still chosen to up the ante with even more procedures. A nose job in January followed by hair straightening, and an overhaul of her teeth, brows, waist, arms (yes, more lipo), and facial skin in May and June last year. Kathy sat down for an interview with PEOPLE magazine and described in her own words why she wasn’t scared to get a few more nips and tucks done. In 1999, I had lipo from my waist down-my stomach, thighs, and the inside of my knees. The idea was to look like Jennifer Aniston. It didn’t work out at all. When I woke up I was not able to pee. I got toxicity and had to go to the emergency room and wear a catheter for a week. It was life-threatening, and the results were nonexistent. In fact, I started running after that and got much better results. Back then I swore I would never get lipo again. I’m still not saying, “Ladies, go have lipo and get your brows put on a different part of your head! It’s a blast!” But I work in an industry where if you don’t get a little nip and tuck, a lady of my age is going to end up playing Katie Holmes’s great-grandmother in the Dawson’s Creek reunion. I’m never going to be Halle Berry, but I want to look as good as I can. I had my nose done because it was a little big. Unfortunately, I think it looks exactly the same. Then I had the Japanese hair straightening done. I love it! It’s a long torturous process, though-like six or seven hours. They play movies for you. I’m Irish, and I have the bad Irish teeth. So I went to a dentist and asked for soap-opera teeth. While they’re making your new teeth, they have to whittle your own down to pegs. I looked like a turn –of-the-century prostitute. He gave me some temporary teeth, but one fell out when I was on the Jimmy Kimmel show. I gave it to Jimmy. That was brutal. A few days later, I had lipo on my upper arms and flanks, which is kind of your kidney area. I don’t know why I did it, because it’s not like I’m running around in those Britney Spears pants-my flanks are pretty much covered all day. But my arms were total car-pool-mom arms, and I wanted Angelina Jolie arms. I thought about going to awards shows in a beautiful, strappy dress. Later that day, I got the brow lift so I wouldn’t have skin hanging over my eyelids, and the facial peel, where they use acid to smooth your lines. Those were under anesthesia. When you wake up it feels like you’re the most tired you’ve ever been. My husband, Matt Moline [a computer programmer], helped me out to the car. It’s easy to tell when he’s trying not to act freaked out. He would never look at me and say, “Oh my God, you’re totally swollen.” But I was. The first night was tough. Even though Vicodin takes the pain away, I got really nauseated. I just had peanut butter and chocolate smoothies. I found that soothing. By the third day I was so swollen my eyebrows were basically at my hairline. Then the peel kicked in. It was like the worst sunburn I ever had. I cried constantly. The burns were so itchy it felt like bugs crawling on my face. There was nothing about me that wasn’t disgusting. Every day I’d look a little worse, and Matt would say, “You look a little better today.” He got tired of giving me sponge baths. I don’t know how he got through it. You have to buy into the fact that you’re going to look really scary and it’s going to be painful. You’ve got a week of hell coming no matter how you slice it. Two weeks later we went on an incredible vacation in Mexico. I still had bruising from the lipo, and a mustache of peeling skin, but I went out in the sun. I wore a lot of sunblock. When I got back, I had my teeth veneers put in. Afterward, they do this tea ceremony at the dentist’s office with fondue. I was so excited about the chocolate. And the teeth are soap-opera perfect. Matt says I look good. I feel good. The peel really took away a lot of lines under my eyes. I love the teeth. And I love the brow-my eyes are a little bit more open. The lipo’s painful. I couldn’t lift my arm all the way up for three weeks. As for my flanks, if there’s a difference, I can notice it only when I’m naked. I wouldn’t do it again. My parents are like, “Promise us this is the last one.” I said, “Unless I grow a new head, I’ve run out of things to do.” I’m sure I’ll do stuff for the rest of my life, but I’m done for a while. 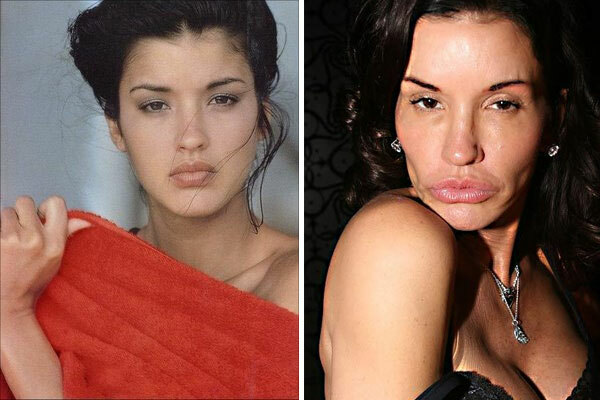 After all those procedures she does look like a completely different version of herself. 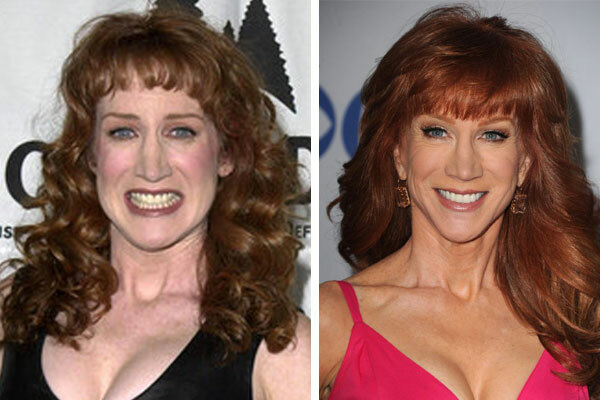 We think Kathy made the right decision, but let’s all keep our fingers crossed that she doesn’t go as far as Joan Rivers, right?! 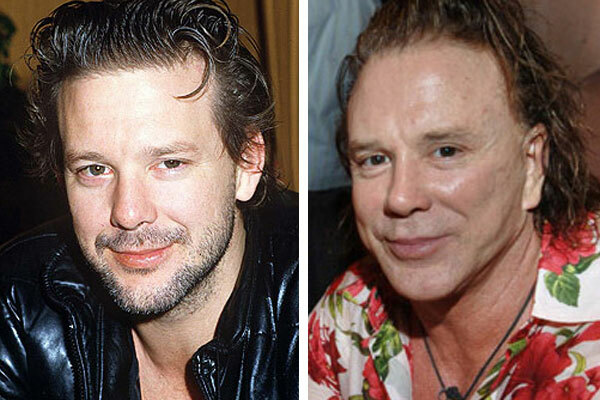 Many people have admired Mickey Rourke’s acting skills over the years, but what exactly has happened to the once leading man’s ruggedly handsome face? 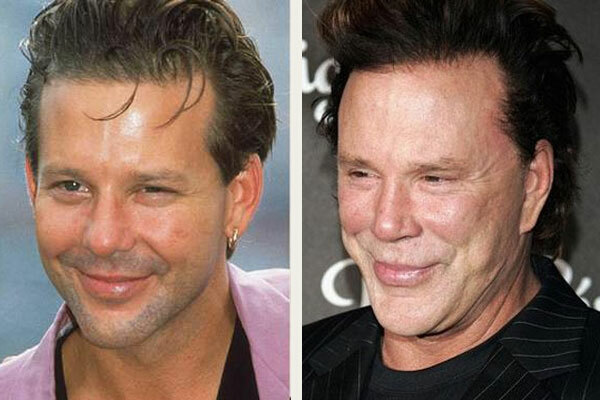 Well, Rourke’s career as a boxer did leave the star with a split tongue, a compressed cheekbone and two concussions from his ten professional bouts. 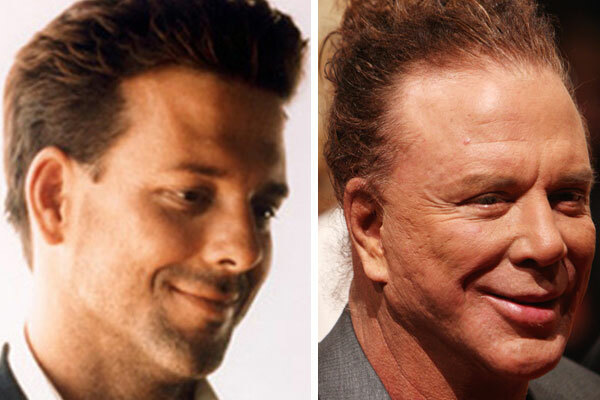 But all of that was even before making a career change to acting, Rourke had a nose job, rebuilding it with cartilage from his ear. So what happened to produce the face we saw in the criticly acclaimed film “The Wrestler”? It appears Mickey has had a brow lift which makes his hairline pull back and reveals much more forehead. His right eyebrow is lower and that affects the right eye, making it look smaller than his left. Mickey may have also undergone an eyelid lift and at least one poorly done face lift that has resulted in to much pulling on the deep layers of the muscles in his face giving him a a deformed dimply appearance on his lower cheeks. It has also been rumored that the actor will undergo some more plastic surgery for a role he will be playing rugby star Gareth Thomas, 22 years his junior.